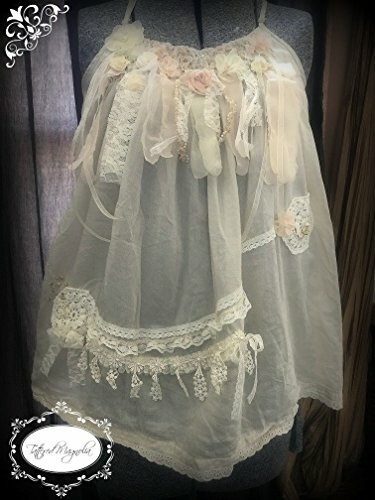 his is made with a mixture of vintage lace and fabric along with pearls to create this romantic tunic. The tunic has a delicate smocking across the top and in the back. There are silk and lace flowers and fabric across the chest in soft shades of creme and beige. The back is a t-back style. All of the embellishments are sewn by hand in a very time consuming method. It takes hours just to create the flowers that have been added. This is a very versatile art to wear top that can be worn to a bridal shower, wedding, to the beach, on a cruise, for date night or just with a pair of jeans. You will get may compliments on this piece! This top will fit a ladies size 1-5. Due to the cut, it has a wider range of sizes it will fit.